Are there resources for obtaining shear capacities for wood-frame shear walls and diaphragms that utilize sheathing thicker than given in the SDPWS capacity tables? The option that tends to be quickest is to utilize capacities from existing SDPWS tables. For example, if 7/8” floor sheathing is being utilized, the tabulated values for 19/32”-thick sheathing could be used. With this option, it is important to ensure that the minimum nail penetration requirements from the SDPWS tables are met. For example, the minimum nail penetration requirement for diaphragms constructed with 19/32” sheathing, when using 10d nails, is 1-1/2” per SDPWS Table 4.2A. If using 3″ 10d nails, the nails would still have the required 1-1/2″ penetration into the framing with 7/8” sheathing. These values may be a little smaller than they would be if full advantage was taken of the 7/8″ thickness, but this provides a quick check. Nominal shear capacities of diaphragms and shear walls are provided for reference assemblies in Tables 4.2A, 4.2B, 4.2C, and 4.2D and Tables 4.3A, 4.3B, 4.3C, and 4.3D, respectively. Alternatively, shear capacity of diaphragms and shear walls shall be permitted to be calculated by principles of mechanics using values of fastener strength and sheathing shear capacity. When calculating diaphragm or shear wall capacity using principles of mechanics, two design checks are typically performed: sheathing capacity (through-the-thickness shear capacity of the panel) and fastener capacity. The panel shear through-the-thickness capacities, Fvtv, can be found in Table 8 of APA – The Engineered Wood Association (APA) publication, Panel Design Specification (D510). The span rating associated with the selected panel thickness would need to be determined using Tables 11 and 13 of this publication. For example, referencing these tables shows that a 7/8″ panel typically has a 48/24 or 32 o.c. span rating. Table 8 in D510 indicates that 7/8” panels are typically OSB or 5-ply plywood. When using the values in Table 8 of D510 to calculate panel shear through-the-thickness capacities, it is important to keep in mind that the load duration factor per Table 2.3.2 of AWC’s National Design Specification® (NDS®) for Wood Construction can be utilized. This allows a 60% increase when designing for wind and seismic force resistance. For most shear walls and diaphragms, fastener capacity will govern over sheathing capacity. A discussion of the mechanics-based approach and some experimentally derived adjustment factors can be found in Appendix B of APA’s Research Report 154: Structural Panel Shear Walls (Q260). These can be used to derive a system capacity. Several examples are given in the appendix of this publication to illustrate the design calculation. Also, the commentary of SDPWS Section 4.2 may prove useful as it contains information on sheathing properties, shear stiffnesses, and fastener slip values for a number of sheathing thicknesses and fasteners. Although not codified design values, several tests have been performed on shear walls and diaphragms with thicker panel thicknesses which may also prove useful. Appendix A of APA’s Q260 provides tested shear wall capacities for some sheathing thicknesses not shown in the SDPWS, including 5/8” and 3/4”. 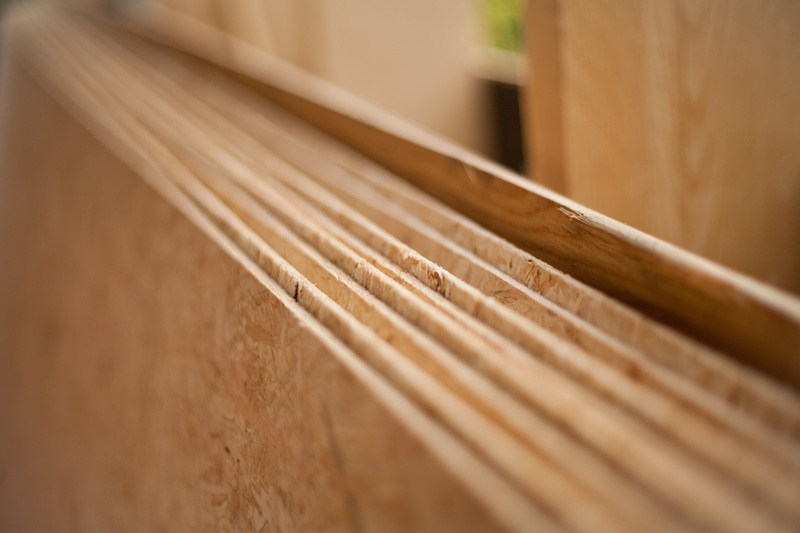 Similarly, Appendix A of APA’s Research Report 138: Plywood Diaphragms (E315) provides tested diaphragm capacities for sheathing thicknesses including 3/4” and 1-1/8”. It should be noted that since these tested capacities are not included in the SDPWS tables, they would need to be approved by the building official under the code’s alternate designs provisions (IBC Section 104.11).